Crud - notice anything strange? You can see I'm getting ready to mix something. I took butter out of the freezer, and some out of the refrigerator and dumped them both on the counter, but grabbed the frozen ones and threw them in the mixing bowl. I turned the big mixer on, and wondered why it was making such an odd sound, but stupid me, I should have stopped. Too late! 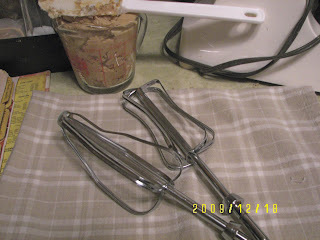 I'm still not sure if I also ruined the mixer, the holes where the beaters snap into - afraid to look. This is a standing, heavy duty mixer. Probably much more expensive than what I paid a gazillion years ago. Duhhhh! Should I be cooking more often, or cooking less often? or not at all??? I WAS kinda stressed - can I use that excuse for my stupidity? Well, the cookies are delicious - and I DID manage to mix them by hand. I hope your mixer is ok. It's hard to get used to a new one, let alone try to pay for one. At least you got some cookies out of it all. Ouch, those are some expensive cookies! Maybe your DH can re-bend the beaters into shape. My DH had to do that once when my hand got stuck in them - I'm not sure how that happened, but it hurt! How stupid is that!! Hee Hee! Oh no, that sounds like something I would do. Keeping my fingers crossed that it is just the beaters and not the whole machine. How is your neck doing? Hope the treatments are helping. Maybe there is a repair store where you live that has parts? We have one in Edmonton that carries everything from beaters to pot lids and can fix almost every appliance. Hope that the mixer is okay, and that you can get some new beaters! If an accident cooking can happen, it will happen to me. that is probably why I do not like cooking. The food is edible but never pretty. I hope you can get new beaters to replace the bent ones. Butter frozen? How long can it be frozen? What a great way to save it!!! It has been on sale for a few weeks and I have bought 2 lbs each week. I do not use that much so I have quite a collection. And I was wondering if I could freeze it! Some snow here in Indiana. I shoveled the drive twice yesterday. Nice heavy snow with no blowing. Actually enjoyed being outside! I do hope those cookies were worth it. Oh wow, I didn't know you could do that! I hope your mixer survived and that you can get new beaters. Maybe you should just buy some cookies next time?? hee hee! If your cookies were delicious, then I guess it means you need to cook more. I would try using those beaters and see how well they beat the next batch! you have a refigerator and freezer. Maybe you should get the message... sew not cook. hugs and Seasons Greetings to You and Yours.